Summer Sale: Grab flat 50% OFF on first 2 food orders today from select restaurants in your city. Maximum discount will be Rs 100 per transaction. Valid only on app for select customers only and will expire soon. Download the Foodpanda app now to get huge discount on your order. Coupon/Offer Details: Verified on 23 Apr 2019. Foodpanda is offering scrumptious and tempting desserts range from handpicked restaurants/cafe in select cities at just Rs 9, No minimum order value required. Deal code is not required to avail the offer. Hurry! Verified on 23 Apr 2019. Indulge all the day in luscious and delectable food varieties of snacks/breakfast/biryani varieties from select restaurants in all operational cities, prices starting at just Rs 19. No minimum order value required. Offer code is not essential to avail the deal. Indulge the love for food with Desserts at Rs 9, Snacks starting at Rs 19, Biryani starting at Rs 79, and much more from your favourite brands at the Crave Party. Verified on 23 Apr 2019. 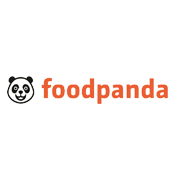 Food panda is offering flat Rs 100 off on all food orders from top rated restaurants while paying via Paytm wallet online. Minimum cart value of Rs 250 is required and valid for all new customers only. Applicable once per user on web. Use the shown foodpanda coupon code at checkout page. Order Now! Coupon/Offer Details: Grab flat Rs 100 off on all orders of worth Rs 275 and above from wide range of restaurants in your location. Valid only for new customers of foodpanda in web and app. Not valid on Dominos, Subway, Pizza Hut and KFC orders. Pay Using HDFC Bank NetBanking @ foodpanda. Offer is valid only on delivery orders, and cannot be availed for pick up orders. Hurry!! Coupon/Offer Details: Verified on 23 Apr 2019. Foodpanda is Offering flat Rs 100 off on foodpanda website / app with your digibank by DBS debit card. Min. order value should be Rs 300. Offer is valid only for new customers. Coupon is valid on Mobile App and web transactions. Offer is not valid on Dominos and Subway. Promo cannot be clubbed with any other running offer. Offer is valid only on delivery orders, and cannot be availed for pick up orders. Find restaurants that deliver to you by entering your address, Browse hundreds of menus to find the food you like, Pay fast & secure online or on delivery and Food is prepared & delivered to your door! Coupon/Offer Details: Verified on 23 Apr 2019. FoodPanda is Offering Flat Rs 75 OFF on min. order value of Rs 250 and above using HDFC internet banking option while paying for your transaction. Offer is valid only for new customers. Promo is valid on Mobile App and Web transaction only. Valid for one time use only per customer. Offer is valid only on online payments. Coupon is not valid on Dominos, Subway. Deal cannot be clubbed with any other running offer. Offer is valid only on delivery orders, and cannot be availed for pick up orders. Coupon/Offer Details: Verified on 23 Apr 2019. Foodpanda is offering flat 20% off on Innerchef orders from foodpanda web and app stores. Applicable in cities like Delhi, Noida, Mumbai, Bangalore, Hyderabad. Use the coupon at restaurant checkout page after selecting food item. Verified on 23 Apr 2019. Get 20% OFF on all 775 Restaurant orders in Mumbai. Choose the nearby restaurant in your area and use the Mumbai offer code at the restaurant page if given and avail the discount. This Foodpanda discount code is valid for all Old and New Users. Min. order value should be Rs 500. Max Discount is Rs 150. Coupon/Offer Details: Foodpanda is providing flat 20% discount on pizza orders in Delhi. Choose your favourite pizza variety from over 127 Restaurants. Valid for Delhi Old and New users. Hurry Up!! Limited Period Offer. Coupon/Offer Details: Verified on 23 Apr 2019. Pune Users: Enjoy Flat 20% OFF on selected restaurant orders. Max. Rs 50 OFF on Minimum Order (Depending On the Restaurant) without using any offer coupon code at the restaurant page. Choose from over 526 Restaurants in Pune. Coupon/Offer Details: Verified on 23 Apr 2019. BurgerKing is the first and largest chain that offers Burgers, Chicken and More, Salads and Veggies, Beverages, Breakfast, Sides, Sweets, Value Menu, Kids Meals and so on all over the country. Order food online from BurgerKing and Get Flat 15% OFF on Rs 299 order value. BurgerKing now delivers to select locations. Order Now. No code is Required. Coupon/Offer Details: You Don't want to miss out any great offers foodpanda then subscribe to its newsletter and get exclusive deals and discount code directly to your email. Receive deals & coupons from all top restaurants via e-mail. Ordering food just got a whole lot easier. Order online from a plethora of restaurants offering a variety of cuisines. From Continental to Italian, Chinese, North and South Indian food, get the best of the lot at varying prices. You’ll be surprised by the wide variety of food and price ranges available, from fancy restaurants to simple traditional dishes. And if you want amazing discounts and save on your purchases, GrabOn is the perfect website. Save on all your purchases as we curate and get you the best coupons and deals from all over the Internet only for you! Foodpanda - Amazing Food With Awesome Offers! Browse a wide range of healthy and hearty cuisines from your favourite restaurant available and enjoy a delicious meal plus get up to 70% Off. New users can get up to 50% off on their first three orders! Coupons for Foodpanda from GrabOn will let you explore various cuisines like Indian, Italian, Mexican, Thai, Chinese and more from your favourite restaurants. Foodpanda App - One Place To Find Everything! The food delivery app is your one-stop solution for everything that is related to food. So, in case you are wondering what to do when you are hungry, just take out your phone! You can also avail some app-exclusive offers and save on your purchases. Get amazing first/new user offers and different kinds of offers based on your method of payments. Sometimes you get offers from UPI platforms like Google Pay or PhonePe. How To Order Food Through Foodpanda? The app/website will show you a list of restaurants that serve to that location. One can then choose the restaurant, select the dish and proceed to checkout. During checkout, you can use our discount codes to help you save on your orders. Cheer up! Your hunger pangs are gonna vanish as soon as that food comes knocking! Cash on Delivery - Pay the delivery executive after he/she reaches your doorstep. You can see an estimated delivery time of each restaurant in that location and after you order. The estimated delivery time for each order will vary depending on the restaurant’s preparation time, traffic, weather, and might not necessarily match the time as estimated on the website/app. How does Foodpanda calculate the delivery fee? It aims to deliver tasty food to all customers efficiently. The delivery fee is charged differently according to the distance between your delivery location and restaurant location. Please contact Foodpanda via Live Chat as soon as possible, if you want to cancel your order! They need to inform the restaurant before they start making the food. If you have any refund related issues you have made online, please contact Foodpanda and not the restaurant. 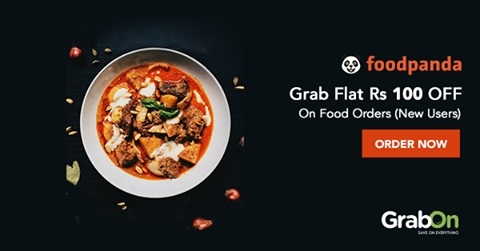 How To Use Foodpanda Coupons On GrabOn? Use our promo code and save big. New users can avail Rs 100 Off and others get flat 50% Off on purchase. Foodpanda provides midnight snacks to busy employees. Loads of work and no time to cook? Visit Foodpanda, enter your address and search for restaurants. You can filter based on the price or cuisine. Enjoy best offers on orders from Bangalore, Delhi, Mumbai or Chennai. Order from Thane, Gurgaon, Noida, Kolkata or Mohali. Or Ahmedabad, Gandhinagar, and Vadodara. Vada pav in Pune and Navi Mumbai. Dhokla in Surat, Rajkot & Panchkula. Butter chicken in Greater Noida, Faridabad and Chandigarh. Kadhi chawal in Jaipur.